Prevent unnecessary bath time discomfort with the White Hot Ducky, a new take on the classic rubber duck. This hard-working bath toy has innovative White Hot technology that warns you when bath water is not suitable for baby's delicate skin. Simply place the duck in the tub, then lift up to check the blue disc on the bottom. If it says HOT, add cool water or let the bath cool down before placing baby inside. 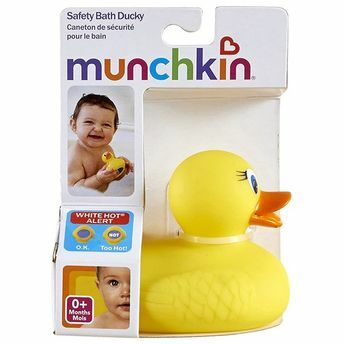 Aside from being a bath safety must, this cute duck is also water-tight, mildew-resistant, and fun for baby to play with, making it a true bathing best friend!